David Harvey has lived a full life, having worked in the media in Hong Kong and Australia and in computer technology. 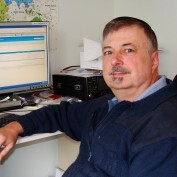 His hobbies include ham radio operation (licensed amateur radio operator vk2dmh). David's other interests are Permaculture, conservation, health and fitness, camping, motor cycling and digital photography. David also shoots and edits videos, mainly of martial arts. He holds a black belt (JAA) in shodokan aikido.